Workmanlike compression for a variety of tasks. Useful compression. Tone knob useful for adding top end. Nice build. Something may have been lost in translation when naming Russian-makers Yerasov's Black Formica, as it's actually blue, and we wonder if the designers are aware that Formica is more commonly known here as a decorative laminate rather than a species of ant. "Based around a high-quality VCA it is capable of some pretty strong compression"
We digress. 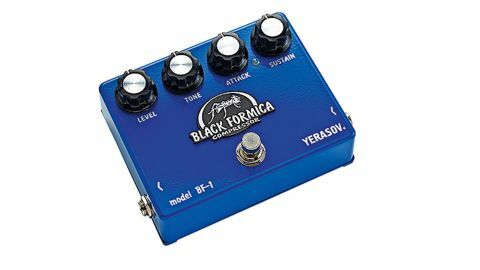 The Black Formica is a four-knob compressor based around a high-quality VCA made by that corporation, and it is capable of some pretty strong compression. Juxtaposition of the attack and sustain knobs is the key: between the two, it's possible to vary the amount of squash, from getting the dynamics a little tighter and evening out chords to a squishy effect, and settings that will eke out sustain. The tone knob is effective for replacing top end lost through compression, or just offering a brighter sound when the pedal is engaged. Its name might suggest something you'd find in a goth's kitchen, but this is a useful compressor for keeping your signal consistent and adding sustain.